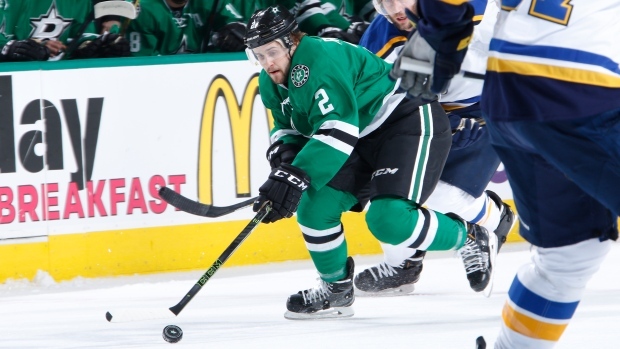 EDMONTON — Free agent defenceman Kris Russell signed a one-year deal with the Edmonton Oilers on Friday night and plans to join the team immediately. TSN Hockey Insider Pierre LeBrun reports the contract is worth $3.1 million. The 29-year-old Russell is a veteran of nine NHL seasons with Columbus, St. Louis, Calgary and Dallas. He has 38 goals and 139 assists in 573 games. The five-foot-10, 170-pound defenceman ranked second in the NHL in 2015-16 with 210 blocked shots split between Calgary and Dallas, and led the league in the same category in 2014-15, blocking 283 shots. He set an NHL record with 15 blocked shots in one game against Boston in March 2015. He has averaged over 23 minutes of ice time per game in each of his past three seasons, setting a career high in 2014-15 by ranking 21st in the NHL. Russell was the Calgary Flames' 2015 nominee for the Bill Masterton Trophy, awarded annually to the NHL player who best exemplifies the qualities of perseverance, sportsmanship and dedication to hockey. The native of Caroline, Alta., has represented Canada on five occasions, winning gold twice at the world junior hockey championship (2006, 2007), and playing at the world hockey championship in 2010 and 2012. Earlier Friday, Edmonton traded Russian forward Nail Yakupov to the St. Louis Blues for forward Zach Pochiro and a conditional draft pick next year. The No. 1 pick in the 2012 draft, Yakupov had eight goals and 14 assists in 60 games last season. In 252 NHL games with the Oilers, the 23-year-old had 50 goals and 61 assists. The draft pick is a third-rounder that would become a second-round choice if Yakupov reaches 15 goals. Edmonton is the first team in NHL history to trade away two of its own first-overall picks in the same year after sending 2010 No. 1 Taylor Hall to New Jersey in June.